Great 3 bedroom, 2 bath 2 car garage villa in desirable Cambray of Panthers Trace community of Riverview. Freshly painted interior. 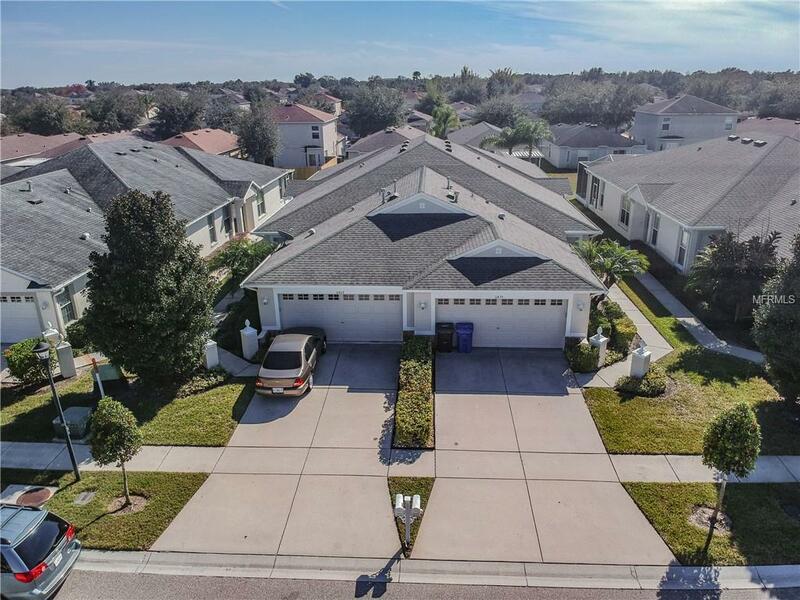 High ceilings, arched decorative cutouts and very spacious and open floor plan villa features new wood laminate flooring living room, carpet in bedrooms and many new fixtures. Kitchen is perfect for entertaining with cherry wood 42 cabinetry with crown molding and granite countertops with breakfast bar that flows into dining room. Also has large pantry and brand new stainless steel dishwasher and other appliances only 1 yr old. Home features huge living room/dining room open concept with sliders that lead to screened in lanai. Split floor plan with 2 bedrooms in front of house and oversized master suite with walk in closet and ensuite with jacuzzi tub, dual sinks and separate shower in the rear. Spacious master suite has tray ceilings, room for sitting area or office and also has sliders to access lanai. Inside laundry room with extra cabinet storage. Panthers Trace is a premier resort style community that is gated and offers access to 2 club houses, community pool, basketball, tennis and volleyball courts, playgrounds, walking trails. Best part of this HOA is that it is maintenance free exterior painting, roof and lawncare. Minutes from shopping, dining and easy commute to US 301 and I-75 for convenient access to the Brandon area, Tampa and MacDill AFB. Hurry with all the amenities, these units move fast! Additional Lease Restrictions Please Contact Hoa For Lease Restrictions And Approval Process If Any. Amenities Additional Fees Cdd Amenities. Contact Anna @ 813-671-0831 For More info. Pet Restrictions Maximum 2 Pets Per Household. Max 50 Lbs Per Pet. No Pit Bulls Or Rottweilers. Listing provided courtesy of Home Clicks Realty Orlando.